C.O. 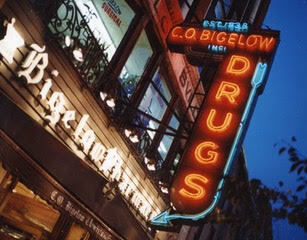 Bigelow Apothecary is the oldest apothecary in America. The Greenwich Village pharmacy and shop is run by 3rd generation pharmacist, Ian Ginsburg. Ian works alongside his son Alec who is the 4th generation pharmacist at the New York City locale. C.O. Bigelow’s is a staple of the village, serving many prominent personalities since it was established in 1838. Mark Twain, Eleanor Roosevelt, and Thomas Edison are among some of the original customers. Legend has it Edison burned his fingers while making an early prototype of light bulb and soothed them with balm from Bigelow’s. Cityscape producer Fiona Shea caught up with Ian and Alec Ginsburg, the father-son duo, and talked about what it’s like to run this well-known apothecary today.